Super Special! 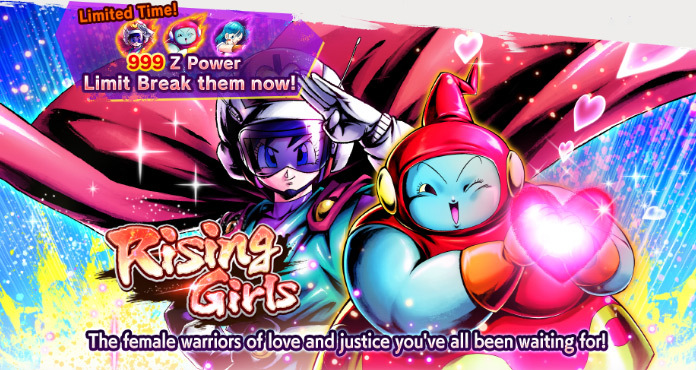 "Rising Girls Vol.2" Z Power x999 Summon on now! *Only Featured Characters' Z Powers are set to 999. Other Z Powers are unaffected. Great Saiyaman 2 and Ribrianne join the fight in SPARKING rarity! Inflicts enemy with Attribute Downgrade "-1 Arts Card Draw Speed level" for 20 timer counts on hit. -10 to own Strike Arts cost for 20 timer counts. Increases Arts Card Draw Speed by 1 level for 10 timer counts. +40% to Strike damage inflicted against "Tag: Lineage of Evil". +10% to damage inflicted per battle member when this character enters the battlefield. +15% to damage inflicted per "Element: PUR" battle member when this character enters the battlefield. +15% to damage inflicted for 15 timer counts upon activation. 50% chance to inflict Paralyze on hit. Song of Love and Victory! Draw the Ultimate Arts Card "Ribrianne Eternal Love" next. Inflict all enemies with "No Switching" for 10 timer counts. Randomly destroys 3 enemy cards on hit. 70% chance to inflict Paralyze on hit. Inflicts all enemies with Attribute Downgrade "+30% to Damage Received" for 25 timer counts. +20% to "Tag: Female Warrior" base Blast Defense during battle. The following effects occur when this character enters the battlefield. Reduces damage received by 30% for 15 timer counts. Inflicts all enemies with Attribute Downgrade "+30% to Strike Damage Received" for 20 timer counts. +30% to Strike damage inflicted per defeated battle member. Additional +25% to damage inflicted per defeated "Tag: Female Warrior". Reduces enemy Ki by 50. Draw a Blast Arts Card next. One of the following effects will also occur randomly. +30% to Blast damage inflicted for 30 timer counts. +50% to own Critical Rate for 30 timer counts. +70% chance to inflict Paralyze upon landing a Blast Arts hit for 30 timer counts. +40% to Blast damage inflicted for 20 timer counts. +40% to Blast damage inflicted when "Tag: Female Warrior" is a battle member.